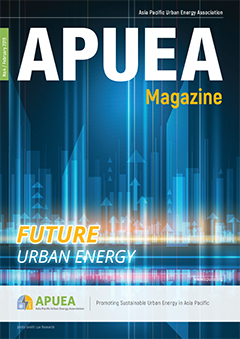 In the fourth issue of the APUEA Magazine, we introduce a guest column, interview ABB´s Martin B. Petersen, and present a recently conducted energy efficiency survey for Asia. The Magazine also includes insights in how digital tools can help in the ongoing digital transformation of the energy sector and updates on recent APUEA activities. We also explore why district energy is a fast track to sustainable energy and present case studies of two modern district energy systems in China and Sweden. 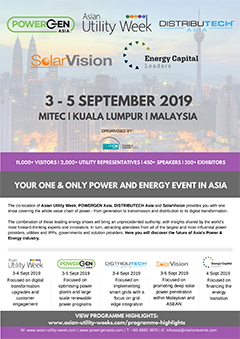 APUEA is a supporting partner to the expos in Kuala Lumpur, APUEA can offer its members a 10 % discount on a 9 m2 exhibition stand at a dedicated space at the Energy Efficiency Pavilion. The exhibition space is dedicated to APUEA members and offers great opportunities to showcase products and interact with expo visitors. The offer also includes a 20 % discount on the Full Conference Delegate package for the 2019 event for exhibitors at the Energy Pavilion. 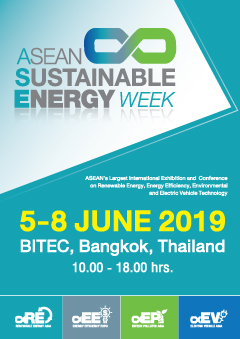 APUEA is a supporting partner to the ASEAN Sustainable Energy Week (ASE) in Bangkok, June 5-8 2019. 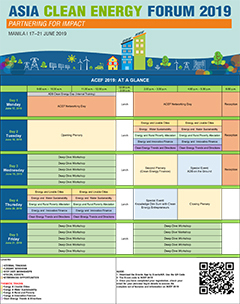 The ASE 2019 is co-located with four unique events: Renewable Energy Asia, Energy Efficiency Expo, Entech Pollutec Asia, and Electric Vehicle Asia. The ASE 2019 will feature the very latest innovative energy technology, along with cutting-edge machinery and equipment from over 1,500 of the world’s leading brands from 35 countries and 12 national pavilions, including Israel, Czech Republic, Germany, China, Japan, Singapore, Taiwan, and South Korea. The event is expected to attract more than 27,000 visitors from 45 countries. The Asia Clean Energy Forum (ACEF) will take place at the Asian Development Bank headquarters in Manila from 17-21 June. This year, APUEA is planning to host it’s Annual General Meeting (AGM) in conjunction with the event in Manila. APUEA also plans to co-host a Deep Dive Workshop on District Energy in collaboration with UN Environment. This will be an excellent opportunity to get insight into the concept of district energy and its challenges and opportunities in the region as well as to meet and network with top professionals in the energy sector. More information will follow soon. The Association provides relevant information and services to its members, including utilities, manufacturers, investors, engineering companies, donor agencies and other sectoral associations. The Asia Pacific Urban Energy Association (APUEA) acts as an information hub to support city policymakers, program managers, and other stakeholders in the design, development, and support of sustainable urban energy systems. Furthermore, APUEA aims to promote the development of sustainable urban energy projects, customized for the different countries in the Asia Pacific region, by actively supporting project consortiums with project development and implementation. The APUEA's database is designed to provide up-to-date information, accessible from an online portal which is administrated by a dedicated secretariat. The information will include market, technical, financial and institutional data related to urban energy, with a focus on the Asia Pacific region.